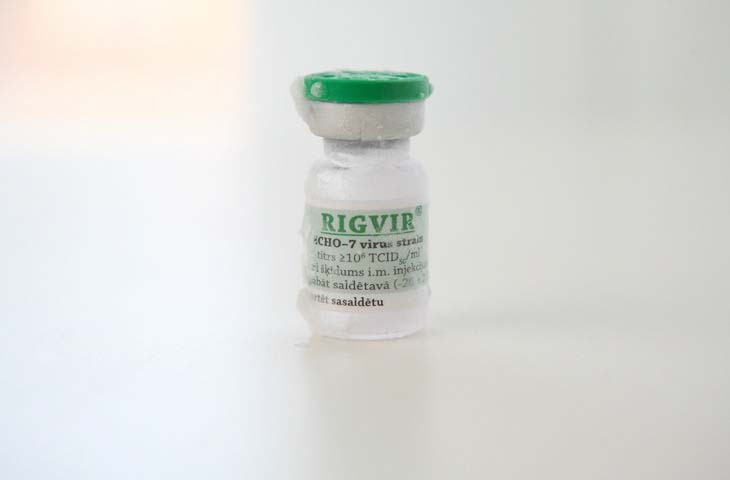 Rigvir® medicine is an integral part of virotherapy. Virotherapy implies treating tumours and metastases with the help of non-pathogenic viruses, and Rigvir® is the first officially recognized. Non-pathogenic virus means that no other disease will appear as a result of Rigvir® injection. Rigvir® is used to conquer different cancer types, including ovarian. Rigvir® history has begun in the 1950-60s in Latvia and stretched out through time and borders. Officially, Rigvir® was registered in 2004 (Latvia), and then it was adopted by Georgia in 2015 and Armenia in 2016. Additionally, oncologists from more than 20 states come to Latvia to learn how to implement virotherapy methods. Rigvir sale is also carried out from here. Why is Rigvir® gaining popularity among international patients? Unlike other common cancer therapies, it doesn’t damage healthy cells of your organism. When you get a Rigvir® injection, the medicine scans your body to detect and destroy the malignant cells. You can use virotherapy for ovarian cancer as the major therapy, or as an additional treatment to radio or chemotherapy. Side effects of Rigvir® is what most patients are usually concerned about. The major one recorded is an insignificant temperature rise up to 37.5°C/99.5°F that lasted for up to three days. Moreover, only a minority of patients face it, so there’s a chance you’ll face none. The latest publication about virotherapy in Melanoma Research, a peer-reviewed medical journal, confirms that survival rates of Rigvir® patients rose in 4-6 times. You’ll get the feedback from the support agent in 2-3 days which are needed for your free case assessment. Regardless of the fact whether you qualify for the Rigvir® therapy or not, you will receive the email with details about your particular situation. For comparison, read Rigvir in Mexico. 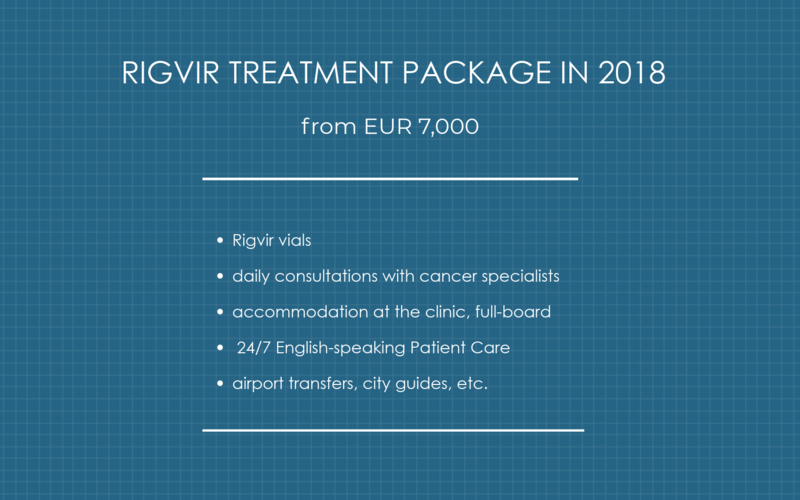 Below see cost estimates for the Rigvir® therapy package. To know whether you or someone you know can benefit from Rigvir® therapy and what budget to plan, click the button below. Brūvere, R., O., Heisele A. Ferdats, A. Rupais, and A. Muceniece, Echovirus-mediated biotherapy for malignant tumours: 40 years of investigation. Acta medica Lituanica, 2002. Suppl. 9: p. 97-100. “Adapted ECHO-7 Virus RigVir Immunotherapy (oncolytic Virotherapy) Prolongs Survival in Melanoma Patients after Surgical Excision of the Tumour in a Retrospective Study.” Doniņa, Simona; Strēle, Ieva; Proboka, Guna; Auziņš, Jurgis; Alberts, Pēteris; Jonsson, Björn; Venskus, Dite; Muceniece, Aina. Melanoma Research: October 2015 - Volume 25 - Issue 5 - p 421–426. Alberts, P., E. Olmane, L. Brokāne, Z. Krastiņa, M. Romanovska, K. Kupčs, S. Isajevs, G. Proboka, R. Erdmanis, J. Nazarovs, and D. Venskus, Long-term treatment with the oncolytic ECHO-7 virus Rigvir of a melanoma stage IV M1c patient, a small cell lung cancer stage IIIA patient, and a histiocytic sarcoma stage IV patient-three case reports. APMIS, 2016. 124(10): p. 896-904.